AuthorEarnings is out there again with their latest report, which they claim – on good evidence – to be the most accurate ever. And just one of the many, many juicy data points is that, “as of mid-January 2016, Amazon’s US ebook sales were running at a rate of 1,064,000 paid downloads a day,” netting $5,755,000, or over $2.1 billion a year. And if you’re an author who wants a piece of that action, you should avoid the Big Five publishers like the plague. AuthorEarnings reports are always full of juicy findings, but also very dense, so for the whole story, I recommend you go to the link at the beginning of this article. They’re also controversial, though, with many pundits criticizing their methodology. So, I’m happy to report first off that AuthorEarnings has apparently overhauled its number crunching and used its revised models to backcheck its original conclusions. “For this report, Author Earnings threw out all of our previous assumptions. We built a brand new rank-to-sales conversion curve from the ground up. This time we based it on raw, Amazon-reported sales data on the precise daily sales figures for hundreds of individual books from many different authors, spanning a period of many months,” they state. “We ended up with nearly a million distinct data points in total.” Comparing their old crowdsourced data to the new methodology, AuthorEarnings found a pretty close match, with perhaps an 18 percent overestimate of ebook sales in the old data. AuthorEarnings now claims that its data crunching matches Amazon’s own reported total daily sales to within 2 percent or less. Maybe that’ll help quieten some of the trad-pub knockers. As said, there’s a lot more you can glean from the report. But for authors, the conclusion should be clear. Boycott the Big Five. They’re cutting their own throats – and yours into the bargain – while enriching Amazon anyway. Previous articleIs Apple still the best for e-book lovers? Paul, if someone asks you to teach a Basic Logic course, turn them down. You love for Amazon and your envy of the Big Five, clearly override your reasoning powers. Really? If one of the largest five publishers on the planet wanted to publish one of my independently published books, I’d jump at the chance. With them behind me, advising, promoting and advertising, I’d make far more money than I am now. They didn’t become the Big Five by being stupid. * At many retail price levels, Amazon only pays 35% and does nothing to promote a book, burying in among millions of others in their system and resulting in typically mediocre sales. That means Amazon is raking in 65% of the retail price of that ebook for doing nothing but process a financial transaction and doing a file download that cost it a few pennies. That’s roughly the equivalent of a mugger who, while he takes most of your money, leaves you with enough to take the bus home. 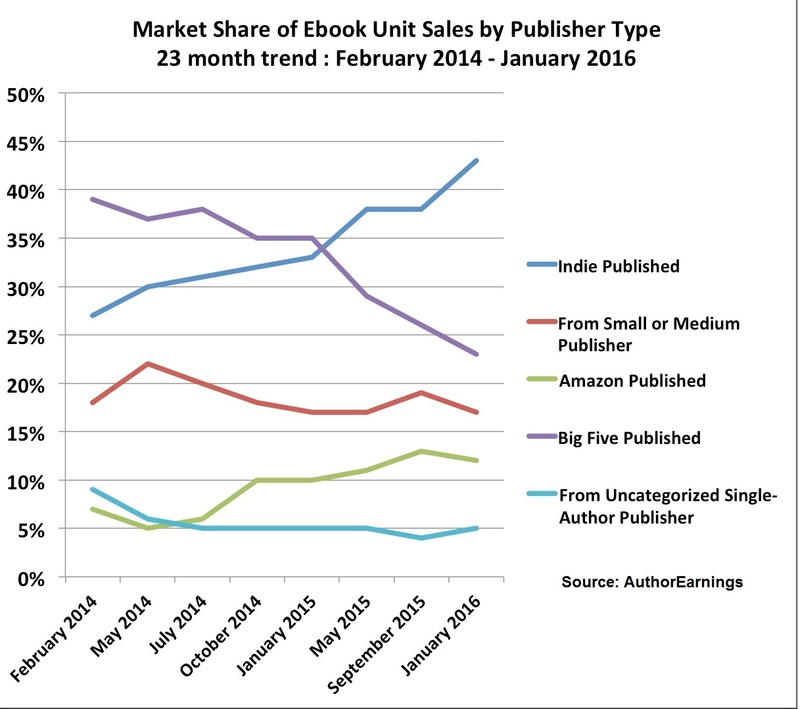 * In contrast, the Big Five will often pay that same 35% for ebooks, but they will also use their expertise and spend many thousands of dollars promoting the sales of that book. That can easily increase the sales ten-fold, making an author far more than they’re earn anywhere else. In short, savvy authors don’t have unrequited love affairs with an indifferent (or worse) Amazon. They know the value that an experienced publisher can bring to their work and they take advantage of that. Getting their attention is another matter. I’m not an author, but I read books. Non-fiction, literary fiction, and genre fiction. I’ve been an avid reader for more than three decades. I read about 40,000 pages per year when I include audiobooks with the paper and ebooks. But I don’t read self-published books. The odds of finding something “good” are too low. I wonder how many of those self-published books are bought by other self-published authors? On social sites like Goodreads there seems to a lot of self-published authors giving other self-published authors glowing five star reviews. Nothing I can prove in a court of law, but the smoke seems kind of thick. I guess “good” is a fungible term and tastes in books do vary but I don’t see how there are enough good books being self-published to truly reflect 43% of ebook sales as an indication of reading preferces. Unless it’s artificial sales like the artificial five star reviews. “Author Earnings” is two words in this situation, not one.